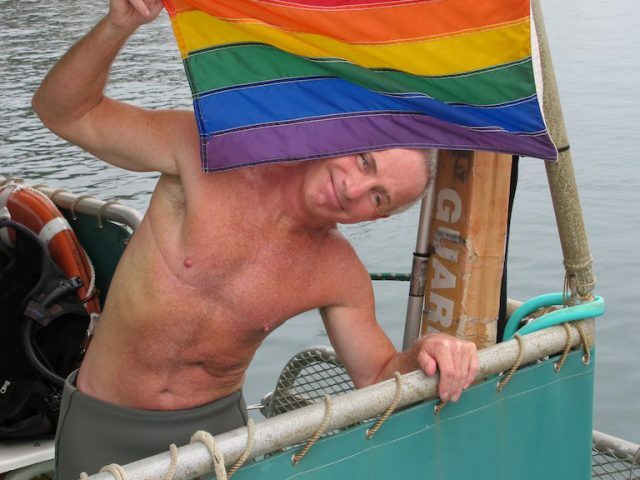 I’m not embarrassed to admit I was severely overweight for my first 40-plus dives as an open water diver. Even the best low-fat diet wouldn’t have helped me. I needed to shed more than ten pounds of lead weight. During those first dives I discovered the aerobic side to diving — kicking constantly and struggling to stay off the bottom, leaving a cloud of silt in my wake. I burned a lot of calories (and damaged a lot of coral) but somehow it wasn’t quite what I had expected. Later, thanks to the advice of a local dive guide, I was able to leave the extra pounds behind and discover the remarkable sensation of diving while properly weighted. I only needed four pounds. What a difference! No longer an aerobic sport, diving is now a relaxing experience. Today, I’m the local dive guide and I’d like to share with you a few tips sure to enhance your diving adventures and help protect the reef. The goal is to take control of your buoyancy. To do this we need to consider the many variables that influence a diver’s buoyancy. Conditions – Are you diving in calm water or rough seas with heavy surge? Are Currents present? Is it fresh water or salt? Keep in mind surge and current can cause Lift and salt water is more buoyant than Fresh. Exposure Protection – Are you wearing a Wetsuit or dive skin? The material used to make wetsuits, neoprene foam, is positively buoyant. Just how buoyant depends on the thickness of the suit and how many dives it’s been on (causing suit compression). Just like divers, wetsuits require less weight with experience! Dive skins, whether made from lycra, darlexx and / or PolarTek are neutrally buoyant and do not require any additional weight. Equipment – has a huge impact an buoyancy. Become familiar with all the features, benefits, even the drawbacks of your equipment. When I ask questions about what type of equipment someone is using, the usual answer is, “it’s pink.” Now, I agree color is important but it really doesn’t help you dive better, regardless of what the salesperson told you. Here are a few facts (not opinions) about dive gear. 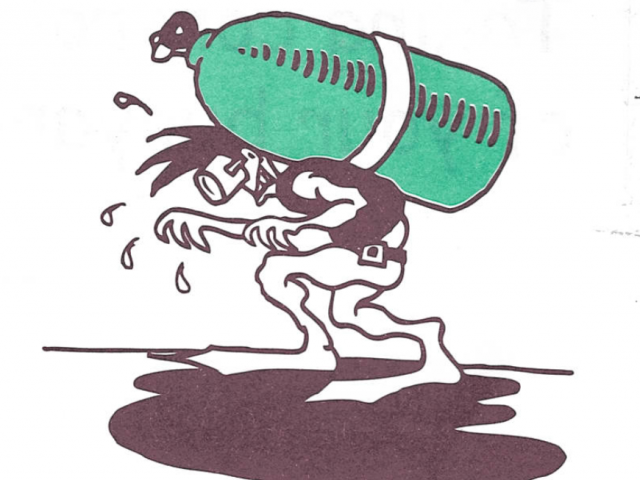 Buoyancy Compensator Devices (BCD) have changed considerable over the years. The older “bladder” style BCs tend to fold and trap air making a diver more buoyant. Most BCDs today are bladderless. Padding in the shoulder straps, back support or tummy band can also add to a diver’s buoyancy by a pound or two. When releasing air from the BCD the deflator unit or dump valve must be the highest point on your body or all of the air cannot come out. For releasing air from the dump valve located on the left shoulder you need to get vertical and lean to the right, raising your left shoulder. Also, some BCDs have Velcro “keepers” over the deflator hose – these need to be undone so the path of escaping air is not obstructed. Tanks have a constantly changing buoyancy of their own. When full, all tanks whether steel or aluminum, are negatively buoyant, (anywhere from -2 to -14 pounds). When empty, most steel tanks remain slightly negative whereas most aluminum tanks become positively buoyant (from + 1 to + 5 pounds). As a tank’s buoyancy changes, so does a diver’s! 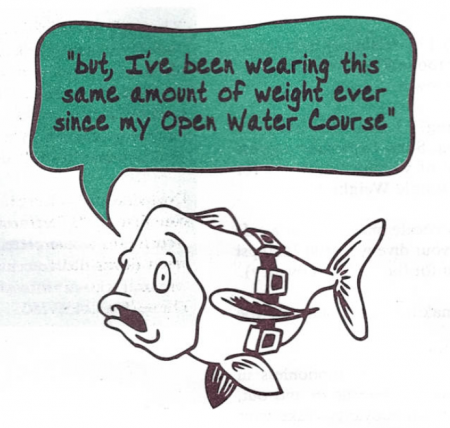 A few other equipment facts that affect buoyancy are the size and weight of fins (heavy fins cause feet and legs to sink); neoprene weight belts; and gloves and booties (the thicker they are, the more buoyant). Accessories such as knives, dive lights and photography equipment can go either way on the buoyancy scale —find out the facts about your equipment. Comfort Level and Breathing Control – Do you really have to be “experienced” to breathe comfortably underwater? Do you consider 40-plus dives “experienced?” for me those 40-plus dives meant that I had gotten really good at being really bad! That’s not experience, it’s endurance! The more comfortable you are diving, the more controlled your breathing will be and vice versa. Your “Internal BC” (your lungs) is a very useful tool in buoyancy control. Always try to inhale slowly, and exhale slowly —• it’s a “Zen Thing” and very relaxing. Change your breathing when you change depth. A good rule of thumb is “when deep, breathe deep — when shallow, breathe shallow.” For me, deep breaths in shallow water usually means popping to the surface. Proper Weighting – There are several things you need to keep in mind when setting up or making adjustments to your weight system. Remove or add weight slowly. One or two pounds at a time “ usually works best. Use small increments of weight whenever possible (four 2 TM pound weights versus two 4 pound weights). Weights should be evenly balanced on both sides of your body. It’s usually best to wear weights towards the front of the body. Positioning weight on your back forces the lower body TM down. A less than horizontal position is not nearly as efficient. Your center of gravity can be adjusted by raising or lowering g the location of the weight belt. Feet too low? Move the belthigher. Feet too high? Move the belt lower. “How much weight should I be wearing?” I hear this question over and over, the truth is I have no idea. Sure, I can take a guess but only you can determine the amount of weight that works for you. To do this, you need to take a very simple Weight Test. Take the test in 15-20 feet of water (with delicate marine life at a safe distance). This is best done at the end of your dive with 800-1000 psi of air remaining in your tank (to account for the tank’s buoyancy). Next, completely deflate your BCD, making sure you’re in the proper position to get all of the air out. Then, without kicking or sculling, attempt to hover motionless in either a vertical or horizontal position. As you breathe in and out, observe the changes your lung volume has on buoyancy. Take your time, relax and see what happens. That’s all there is to it. Interpreting the results is just as simple. If you slowly begin to sink, you’re probably a little over-weighted. If you sink like a stone, you’re definitely over-weighted! On the other hand, if you slowly begin to ascend, you may be a little under-weighted. After returning to the surface, adjust your weights accordingly (remember to do this slowly) and take the weight test again on your next dive. Keep repeating these steps until you find the amount of weight that’s right for you. This article its reprinted courtesy of the author, instructor, and our friend, Patty Grier. She offers workshops in buoyancy at the fabulous Coco View Dive Resort in Roatan. Make sure to join in this class the next time you stay there!